– Rock ‘n’ Roller Coaster Starring Aerosmith from Sunset Boulevard section of the park. It was opened on July 29, 1999, and has a sibling in Disneyland Paris. The rollercoaster include half-vertical loops, half-corkscrews and a sea serpent roll sections and starts with up to 5G acceleration! – Alien (Little green man from the Toy Story) greeting us from his flying saucer. This one comes from Alien Swirling Saucers attraction, located in Toy Story Land. This ride is pretty new, as it first opened its doors on June 30, 2018. – The Twilight Zone Tower of Terror, a.k.a. 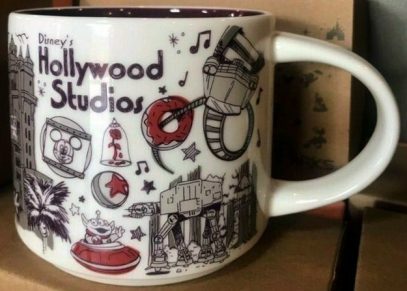 Tower of Terror takes up a significant portion of the mug’s surface. Did you know that there exist two other Towers in Tokyo DisneySea and Walt Disney Studios (France) parks. More than that, there was the fourth one in Disney California Adventure Park, before it was remodeled into Guardians of the Galaxy – Mission: Breakout! and reopened on May 27, 2017. Except for Tokyo’s version, the attractions are inspired by The Twilight Zone series and take place in the fictional Hollywood Tower Hotel in Hollywood, California. I could not resist making a collage of all of them.